Our family (2 adults 2 children) from Australia travelled Sri Lanka in April 2019 for eight days. 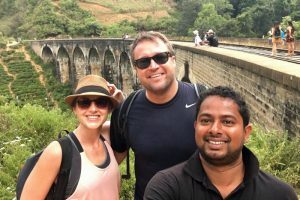 Our route was Negombo- Sigiriya – Kandy – Nuwara Eliya – Hikkaduwa – Colombo. Ranjith Alwis was our driver and guide. He has over 25 years experience as a tour guide and he also deservedly won a major Sri Lankan tourism award in 2018. We would recommend Ran very highly as a driver and guide. His knowledge of Sri Lanka was fantastic. With his extensive experience as a guide he gave us a thorough insight to Sri Lanka. For example when we wanted to climb Lion Rock he suggested the perfect time to reduce the effects of the extreme heat. Do not underestimate the importance of a safe driver in Sri Lanka. We never felt in danger once with Ran. He was not only punctual every day but was also able to estimate extremely accurately the time of arrival at each destination. Ran was extremely flexible and and did not pressure us in any way. His motto “your tour your choice” is so true! See more information and photos of Ran Holidays - Sri Lankan Experience or Send Message.